SOS Online Backup provides users with high-end cloud backup and archiving solutions—though high-end doesn’t necessarily mean high cost. Developed by Infrascale, a company that is well-versed in the cloud storage platform, SOS Online Backup implements a secure and reliable approach to cloud storage. SOS Pro users are typically looking to safeguard their personal and professional information and make it accessible from a variety of locations and devices—which is where SOS Online Backup truly shines. Over the years, SOS Online Backup has impressed its users and reviewers (having won four consecutive PC Magazine Editors’ Choice Awards) on its reliability, ease of use and intuitive design. Developing an application that caters to lesser experienced users without removing key functionality and powerful features is no easy task, but SOS Online Backup manages to handle that delicate balancing act superiorly. SOS Online Backup’s Continuous Data Protection scans your computer for new and updated files while you’re working and conveniently sends them to the cloud for storage. Forward-thinking features like this help make SOS Online Backup a top choice among cloud storage solutions. SOS Online Backup takes the security of your data to a whole new level by using military-grade encryption: a three-tiered process that the most secretive and private institutions in the world use for their data protection. The three-tiered process includes a level of encryption at the local level, so that the data on any computer or device that uses SOS Online Backup is secure. The second level of encryption occurs during the transmission phase of backup, when files are being uploaded to the secure data centers. Finally, your files are encrypted again while stored in the data center. You would be hard-pressed to find another cloud storage solution that uses such a stringent security safeguard for your files. The SOS Online Backup Support Portal provides a substantial amount of access to product support teams. In most cases, you can quickly locate the answer to your inquiry by searching the knowledge base. This is a comprehensive database of relevant articles that are accessible by simply typing your question into the ‘Ask Us’ dialog. Additionally, a live chat option gives you the opportunity to communicate directly with a support representative Mon-Fri from 7 a.m. – 5 p.m. (PST) and Sat-Sun from 8 a.m. – 3 p.m. (PST). Additional customer support is provided by submitting a ticket via the SOS Online Backup website. Simply provide your email address, subject, a description of the problem and if applicable, provide any other helpful information like a screenshot of the issue to help quickly resolve any problem. While the security of your data should be of paramount importance users, the usefulness of backed up data increases exponentially when you can gain access to it from anywhere. Thanks to their online backup portal, you can access your music, videos, photos, business presentations or any other file using most browsers with an Internet connection. Mobile phone apps are also available via Android and iPhone applications so that you are never truly ‘away’ from your data. SOS Online Backup enables you to access and share any of the backed up files with friends, family and co-workers by simply providing an email address or Facebook account information. You can even restore your data onto another device and not just onto the device you originally backed up. Speed tests concluded that SOS Online Backup performed twice as fast as other online backup providers, averaging 1GB every 15 minutes. 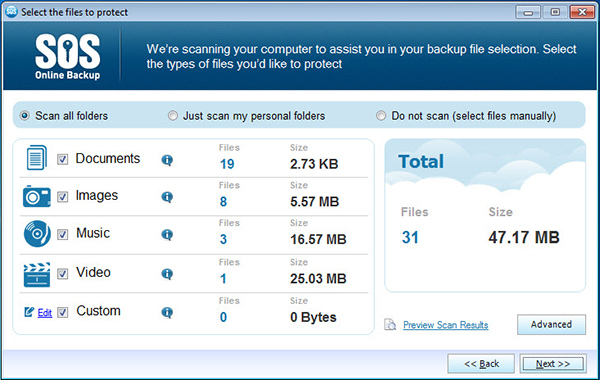 SOS ForeverSafe ensures unlimited archiving, meaning that your backed up files are archived and available to you forever. The following pricing breakdown is based on a two-year plan with SOS Online Storage. Having high expectations of your online storage provider should be a given. SOS Online Backup lives up to those expectations by providing an invaluable service that is remarkably easy to use. Users with a variety of storage demands and skill levels are going to find that SOS Online Backup puts quality into every aspect of their business. Their unparalleled security safeguards and feature-rich interface are combined with affordable, flexible backup plans that avert sticker shock. The only shock you may receive from SOS Online Backup is when you realize just how easy online backup has become.